WASHINGTON (AP) — Michigan Gov. Rick Snyder on Thursday blamed career bureaucrats in Washington and his own state for the Flint water-contamination crisis, while the head of the federal Environmental Protection Agency faulted him and other state officials. At a contentious congressional hearing, the Republican governor repeatedly apologized for his role in the crisis, which occurred when state officials switched Flint's water supply to the Flint River two years ago to save money in the predominantly African-American city of 100,000 north of Detroit. "Not a day or night goes by that this tragedy doesn't weigh on my mind — the questions I should have asked, the answers I should have demanded," Snyder said. EPA Administrator Gina McCarthy, for her part, faulted state officials, noting that the impoverished city was under state management when the city's water supply was switched in April 2014. State officials did not require that the river water be treated for corrosion, and lead from aging pipes and fixtures leached into Flint homes and businesses. About 8,000 children under the age of 6 were potentially exposed to lead, and elevated lead levels have been found in at least 221 children and 104 adults in Flint. Lead contamination has been linked to learning disabilities and other problems. "The crisis we're seeing was the result of a state-appointed emergency manager deciding that the city would stop purchasing treated drinking water and instead switch to an untreated source to save money," McCarthy said. "The state of Michigan approved that decision." McCarthy acknowledged that the EPA should have been more aggressive in testing Flint's water and requiring changes, but she said the agency "couldn't get a straight answer" from state environmental officials about what was being done in Flint. McCarthy refused several requests by Republican lawmakers to apologize. "It was not the EPA at the helm when this happened," she said. The nearly four-hour hearing produced no major revelations, although Snyder for the first time acknowledged that a state law, which allows state-appointed officials to take control of troubled municipalities, failed in the case of Flint. Several Democrats on the House Oversight and Government Reform Committee called for Snyder to resign, while Utah Rep. Jason Chaffetz, the oversight panel's chairman, and other Republicans said McCarthy should step down. White House spokesman Josh Earnest said McCarthy understands how serious Flint's problems are, adding: "There's a strong case to make that the United States of America has never had a better administrator of the Environmental Protection Agency than Gina McCarthy." Rep. Elijah Cummings of Maryland, the panel's senior Democrat, said Snyder would likely face criminal charges if he were running a business — a dig at venture capitalist Snyder's oft-repeated claim to run state government like a business. Besides facing charges, Cummings said of a corporate CEO in Snyder's shoes, "the board of directors would throw him out, and the shareholders would revolt." Snyder told lawmakers that officials at the Michigan Department of Environmental Quality repeatedly assured him that water being piped in from the Flint River was safe, when in reality it had dangerous levels of lead. But Cummings said the governor should have pushed back against state experts. The committee has obtained documents "showing that people all around the governor were sounding the alarms, but he either ignored them or didn't hear them," Cummings said. 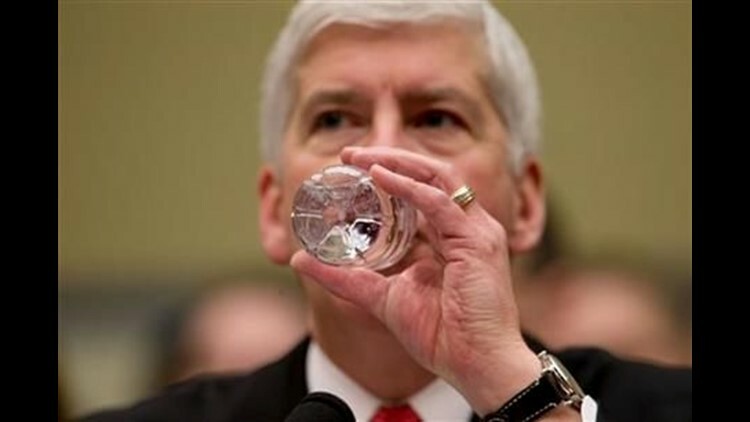 He cited an October 2014 email from Snyder's top legal adviser warning that Flint should "get back on the Detroit (water) system" as soon as possible "before this thing gets too far out of control." The warning came a year before Snyder says he became aware of the lead contamination on Oct. 1, 2015. Dennis Muchmore, Snyder's former chief of staff, wrote emails in July 2015 warning that Flint residents who had complained about the smell, taste and appearance of the water were "getting blown off" by state officials. Snyder said he took immediate action after learning that Flint's water was contaminated. He reconnected the city with Detroit's water supply, distributed water filters and began testing children and adults for elevated lead levels, he said. The EPA deserves its share of blame, too, Chaffetz said. He told McCarthy in one of several heated exchanges, "You had authority under the law (to fix problems in Flint) and you didn't do it." Rep. William Lacy Clay, D-Mo., scoffed at the outrage from Chaffetz and other Republicans, noting that the EPA under President Barack Obama is a favorite target of GOP politicians who routinely accuse the agency of overreach. In Flint, Republicans "now say the Obama EPA should have stepped in and overruled the Republican governor of a state," Clay said, his voice rising. "The irony is almost overwhelming." Associated Press writers David Eggert in Lansing, Michigan, and Kevin Freking in Washington contributed to this story.